This game will continue a three game series between the New York Mets and the San Francisco Giants, that is going to be played at the At&T Park. At the time of writing, the first game of the series has not been played yet, so we will look at their stats from the end of their previous series. The Mets are coming from a terrible four game series against the Los Angeles Dodgers, where they were unable to get a single win, losing the first game 10 – 6, the second a terrible 12 – 0, the third an 8 – 2 and the fourth and last 6 – 3 loss. The Giants are also coming from a bad series, with theirs being a four game series against the Atlanta Braves, which they started by losing the first game 9 – 0. In the second game, they were able to bounce back and won the game 6 – 3, but in the third and fourth game, they lost again with 5 – 3 and 12 – 11 results, ending the series three games to one for the Braves. These two teams are having different season, but neither of them can be considered to be having a great performance throughout the whole season. The Mets have won thirty one and lost forty one of the seventy one games they have played in 2017, for a winning record of .431 that has them as the fourth placed team in the eastern division of the National League, three games behind the Atlanta Braves in second place, although twelve games behind the Nationals, but only a game and a half game behind of the Miami Marlins in third place. They have to visit the Giants at AT&T Park with an away performance that has been pretty poor, having won fourteen of the thirty two games they have played there, for a .438 winning percentage when in away from their home crowd. The Giants are having a definitely bad season, having won only twenty seven and lost forty eight of the seventy five games they have played in 2017, for a winning percentage of .360 that has them in the last place of the western division of the National League, twenty one and a half games behind the division leaders and this series’ rivals, the Colorado Rockies, and three games behind the San Diego Padres. They receive the Mets at their stadium, where they have been average at most, having won fourteen and lost eighteen of the thirty two games they have played there, for a .438 winning percentage. Both teams are coming from bad performances, with the Mets having lost their last four games, while the Giants have lost their last two. The Giants have only been able to get one win in their last ten games, while the Mets have done slightly better, by having two games and losing the other eight. Jacob deGrom will be the starting pitcher for the Mets in this game, and he will be making his fifteenth start of the year. In his previous starts he got six wins and three losses, while leaving five games before deciding them. He has pitched 89 innings, allowing 82 hits, 40 runs and 13 home runs, while striking out 106 players and amassing an earned run average of 3.94. Johnny Cueto will be the starter for the Giants in this game, which will be his sixteenth start of the season. He has won five games and lost seven, leaving three games undecided for a pretty Ok record in 2017. He has pitched 93.2 innings, allowing 97 hits, 49 runs and 17 home runs, accumulating an ERA of 4.42 and striking out 90 players. 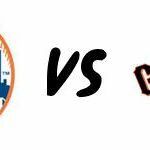 This game has both teams needing a win, and we believe the Mets will be able to get this first win of the series, and they will also get this win. The total is being set at 7.5 runs, so we suggest you go for the over.